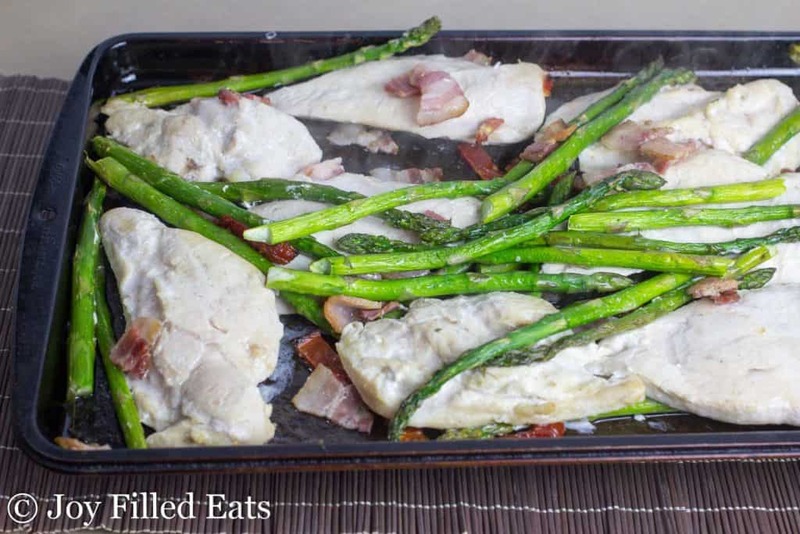 Easy chicken asparagus sheet pan dinner is a quick and easy weeknight meal to add to your menu. 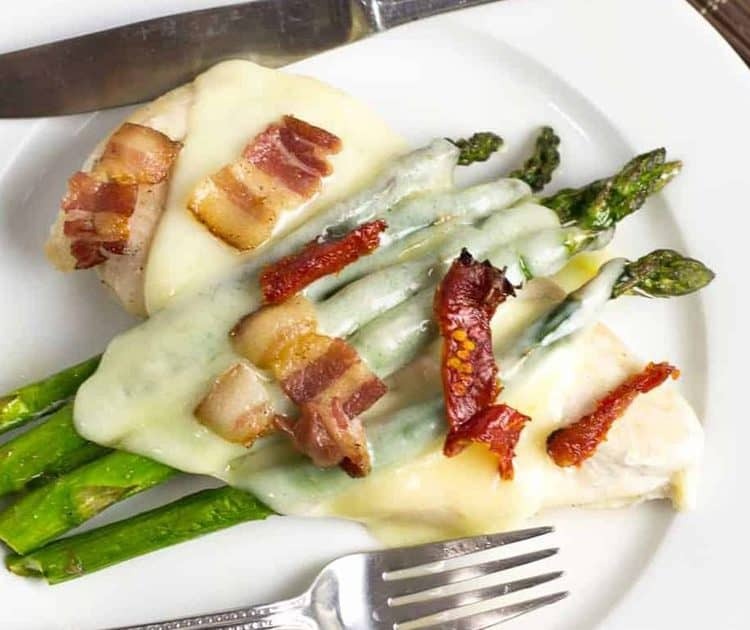 Juicy chicken, topped with bacon, sundried tomatoes, asparagus and a layer of cheese. Bake in the oven, for a no-fuss dinner that will be ready in no, time! When spring arrives, I love seeing fresh asparagus in the produce section at the store. It is such a nice change from a winter of broccoli and green beans to have asparagus hit the grocery store in the spring. It is such a versatile vegetable that we utilize as much as possible when it is in season. We love it roasted and grilled. I even have some roasted asparagus saved in the fridge that I’ve been thinking of turning into a soup. That may be my project for our snow day tomorrow. If you are dairy-free or don’t care for cheese, you are more than welcome to leave it off. I know there are a lot of options these days in stores that give you the cheese taste but not made from dairy! Get your oven preheating, and drizzle the oil onto your sheet pan. This will help prevent your veggies or chicken from sticking. 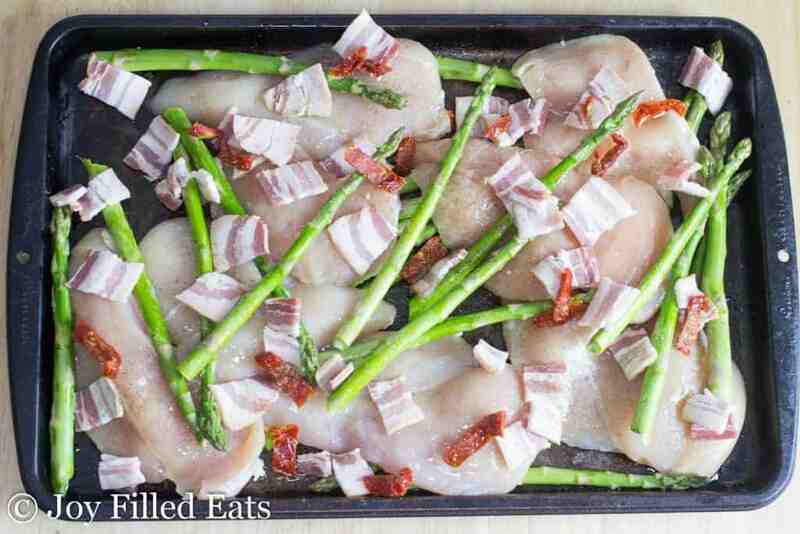 Then place your chicken and asparagus on the pan, and top with your tomatoes and bacon. Season, and bake for 25 minutes or until you reach the correct internal temperature. Toss on the cheese on top of the chicken and asparagus, and add more tomatoes and bacon, and cook for 4 minutes or until cheese is melted. Plate and serve this gorgeous and healthy weeknight dinner dish. Aim to use room temperature chicken, if you can. I find that it will offer a more even cook instead of pulling the chicken straight from the fridge. Don’t have chicken breasts? Substitute chicken thighs. Just ensure your chicken is cooked through and reaches the correct internal temperature. If you don’t love asparagus or it is not in season, go for zucchini, cauliflower, broccoli, green beans, or another hearty vegetable. Feel free to make a light gravy to drizzle over the top, if you are looking for more flavor to bring to the dish. What meat goes good with asparagus? I find asparagus to be very versatile in the dishes you can create. I generally reach for chicken, that is our favorite protein to pair with asparagus. 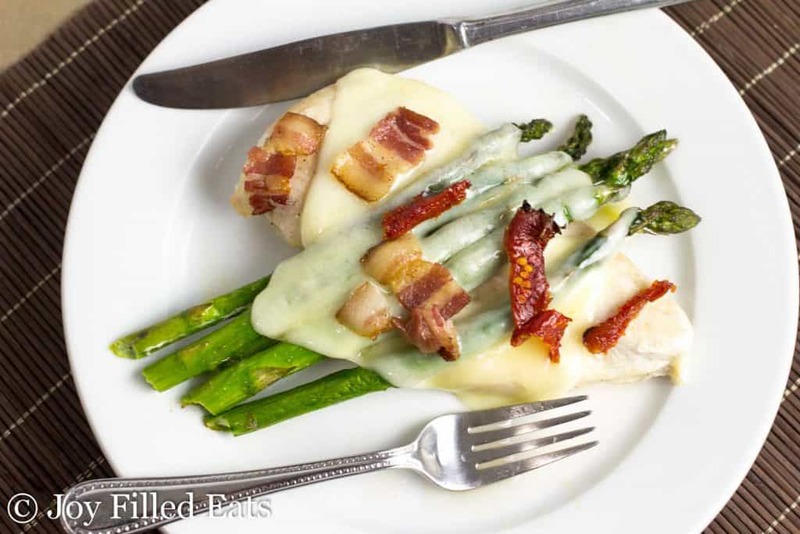 I love chicken stuffed with asparagus and wrapped in bacon. But steak, pork chops, pork loin, and more all pair nicely. What cheese goes well with asparagus? Provolone, Havarti, Monterey Jack, and even Fontina cheese all pair nicely with asparagus. I like the little bit of creamy bite that Havarti offers. For this chicken asparagus recipe, I generally use Havarti or provolone. You don’t need an extra side to pair with this chicken sheet pan dinner, but you are welcome to add a buttered almond flour biscuit, crisp green side salad, or even another type of vegetable. Another lighter option is mashed cauliflower or cauliflower rice to serve with. Absolutely! If you love to plan out meals for your lunches or quick dinners, this is a fantastic dish. Prep and cook your chicken dish, then place in single serve containers. Toss in the fridge and grab and go for a quick and easy lunch or dinner on busy weeknights. 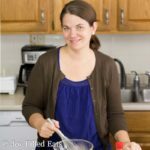 This is an easy baked chicken recipe that is great for making ahead of time for meals down the road. If you don’t eat all your dinner, feel free to place leftovers in an airtight container and place in the fridge. Like I noted above this is great for meal prepping for the week. This recipe isn’t the best at freezing as the asparagus will break down and become mushy once it thaws and reheats. So make as much or as little as you think you will eat before it goes bad. As you can see this chicken sheet pan dinner is a breeze to make. A handful of ingredients, a little time, and you can ring that dinner bell and bring in your family to a wholesome dinner that you can be proud of! Let me know how you enjoy this incredible dinner; it is a family favorite here! Have you made a chicken asparagus sheet pan dinner before? Preheat oven to 400. Drizzle the oil on a large sheet pan. Put the chicken breasts and aspargus on the pan. Put the bacon and sundried tomatoes on top. Sprinkle with the salt and pepper. Bake for 25 minutes or until chicken is cooked through and reads 160 on a meat thermometer. 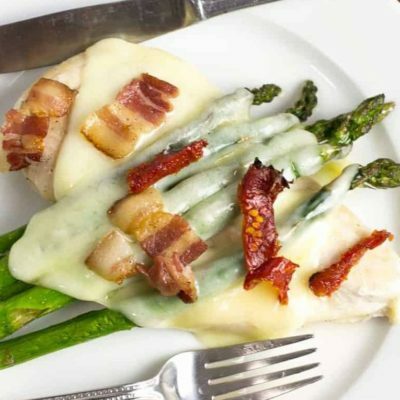 Stack asparagus on top of the chicken, put a slice of cheese on top, sprinkle with tomatoes and bacon, and bake for an additional 3-4 minutes to melt the cheese. Originally PublishedMarch 13, 2017. Revised and Republished March 26, 2019. This dish includes some of my most favorite ingredients and looks absolutely delicious! 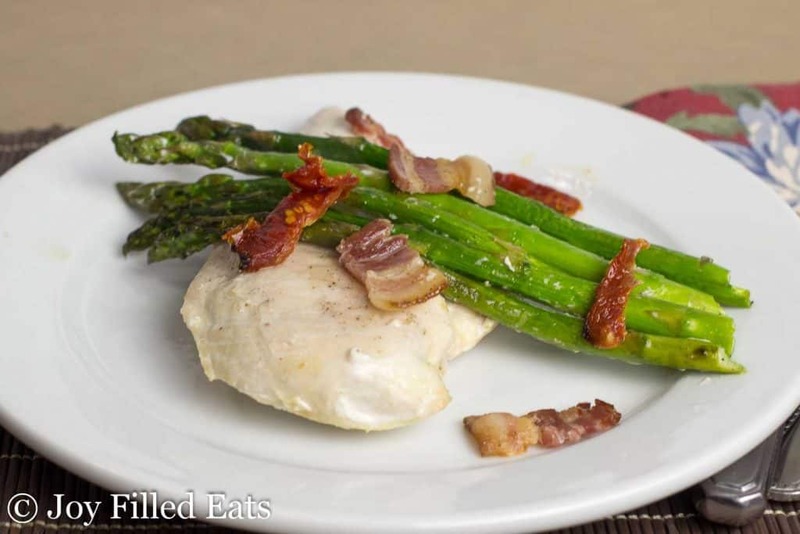 Oh how delicious does this chicken and asparagus dinner look! Love the flavors and how simple it is to make! Pinning for later!